Empowerment and inspiration can be found in the stories of those who have preceded us. For CSUN’s students of color, that inspiration can be a catalyst for achieving their dreams. 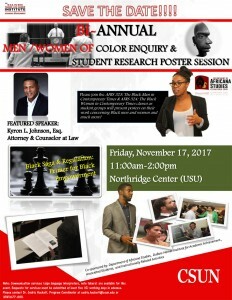 Students will share where they have found the seeds of empowerment at CSUN’s fall Bi-Annual Men/Women of Color Enquiry and Student Research Poster Session from 11 a.m. to 1 p.m. on Friday, Nov. 17, in the Northridge Center of the University Student Union, located on the east side of the campus at 18111 Nordhoff St. in Northridge. The session will feature student research, as well as an appreciation of African heritage and a reflection on the culture and experiences of black people. In addition to the posters, some students will perform “Black Manologues,” soliloquies that address themes in a black man’s character. The event’s scheduled keynote speaker is Camarillo-based attorney Kyron L. Johnson. Johnson grew up in Ventura County and was a standout football player in high school. He was scouted by some of the nation’s leading colleges, all interested in having him play for their teams. Hackett, who played football with Johnson, said attention from those colleges disappeared when Johnson made it clear that his career interests were academic, not athletic. For more information about the Men/Women of Color session, email Hackett at cedric.hackett@csun.edu.